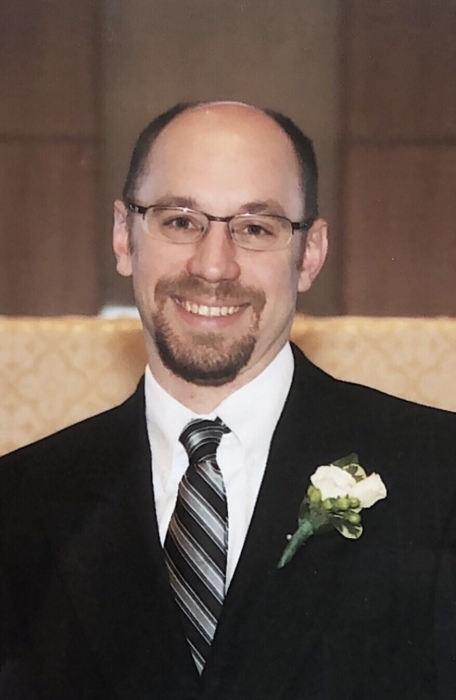 Kevin James Mackrell, age 46, passed away October 21, 2018. Kevin is survived by his wife, Becky; mother, Carole; sisters, Gwynne and Katie. Kevin was born in Syracuse, NY, to Jim and Carole Mackrell. Along with his two sisters, Gwynne and Katie, he lived with his family in Easton, PA, before moving to Puerto Rico for four years. His Spanish language skills were soon forgotten when the family settled in Maryland, where Kevin continued his education through high school. Within the family Kevin was dubbed the "angel boy" by his Nana, in contrast to his two "rotten" sisters. Kevin went on to earn his BS in Biology from Ohio University and joined RPR/Aventis/Sanofi for 17 years following in his parents’ employment path. He enjoyed snowboarding at Hunter Mountain, biking and triathlons, and became a dedicated Flyers fan. During his college years, Kevin developed a love of camping as a camp counselor in Honesdale. Upon meeting his future wife Becky in 2010, he was drawn into her family's involvement at Camp Oneka, a girls’ overnight summer camp in the Poconos. Soon after their marriage, he abandoned the 9-5 drudgery, and he and Becky became the owners of the camp. Kevin assumed maintenance as well as staffing and camper recruitment duties during the rest of the year, while Becky continued her full time "day job" as a Latin teacher. Throughout the summer season, Kevin committed himself to maintaining the traditions and values of summer camp. Kevin was known to wear some wild hats, play with the campers, and he had a special gift for connecting with young people. Kevin was quick to smile and his focus was always on making sure others had the best possible experience at camp. He had a passion for travel which he and Becky shared through trips to Italy, Greece, England, Iceland, Nicaragua, Costa Rica, and around the United States. Kevin was always looking for the next adventure, and loved blending travel with music festivals. Whether he was climbing volcanoes, visiting a coffee plantation, or trekking through geysers, Kevin loved experiencing the world. Kevin was always the "fun uncle" to his eight nieces and nephews lovingly shared with Gwynne and Ken, Katie and Chris, and Jenn and Vince. He still continued to enjoy biking and hiking and rooting for the Flyers. Kevin will be remembered for his sense of humor and gentle spirit in all of our lives. Relatives and friends are invited to his Mass of Christian Burial, Friday, October 26, 2018, 10am, at St. Peters Church, 2835 Manor Road, West Brandywine Twp., where friends may visit from 9am-9:45am. Int. All Souls Cemetery. In lieu of flowers, a donation in Kevin’s name can be made to the Turtles Trail Foundation, turtlestrailfoundation.org. or gogetfunding.com/war-canoe-restoration.